If you are looking for an easy architectural plant then Yucca plants are one to consider. Sometimes known as ‘soapweed’, ‘Adams Needle’ and Spanish Dagger, most species are a fast growing shrubs to small trees originally from Mexico through to Arizona. They grow well in full sun and part shade, and as long as drainage is good they are very easy care. Yucca filanentosa and Yucca elephantipes are two of the more popular species. However other varieties are increasingly popular both in the home garden and a landscaping plants, Yucca vary greatly in size and form. Yuccas commonly used in landscaping include lower growing types such as Y. gloriosa, Y. filamentosa and Y. flaccida. Yucca plants prefer a warm position and a well drained soil. Yucca tend to grow to be quite large however they are suitable for indoors in a well lit position. Indoors the foliage tends be softer in texture and elongated, however very attractive. Yucca glauca is the floral emblem of New Mexico.Yucca treculeana is known as ‘The Spanish Dagger’ a spectacular yucca growing to 5m, the flowers of this yucca are said to be eaten in Latin America. Yucca harrimaniae is a lower growing variety that would suite a rock garden. Grow in the garden or in a pot or container as a feature in a courtyard garden. Yucca brevifolia or Joshua Tree will grow to 15m. The soap tree yucca or Yucca elata grows from2-5m depending on conditions. Yucca rostrata ‘Sapphire Skies’ is a cultivar of Y. rostrata, will grow well in a pot or container as a specimen plant. Of the taller growing varieties Yucca rostrata is an interesting and perhaps sturdier form. Yucca filamentosa is known as ‘Adam’s Needle’ and with its lance like foliage and colorful flowers is a stunning plant, look for cultivars such as ‘Bright edge’, ‘Variegata’, ‘Ivory Tower’ and ‘Golden Sword. Yucca elephantipes is suitable for growing in a large pot. Yuccas are easy care and can be grown from cuttings (taken during the warmer months in cool area). Remember that Yuccas will need a position which receives plenty of sun if they are to flower. 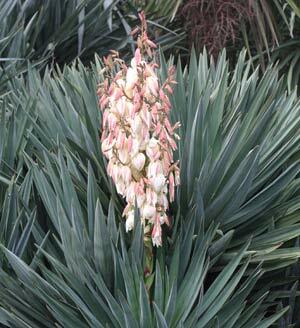 Yucca require a well drained position and do not like to damp soils. Yuccas are generally sun loving, however they will cope with some shade, in general yucca require a well drained soil. Yuccas are generally drought tolerant and require very little maintenance. Removal of spent flower heads, occasional watering and fertilizer application every month or two will keep your yucca in good condition. If you plant is becoming to tall, you simply cut the top off, it will reshoot in no time at all. The best time to do this is in spring as new foliage grows the fastest at this time. Yuccas can be grown (propagated) from seed or cuttings. Cuttings are best taken in the warmer months, simply find a mature stem and remove it with a sharp knife. Let the cut section heal or dry for 2-3 days. Plant in a well drained potting mix. Tall cutting may need to be staked. Yucca can be grown in the garden or in pots or containers and do well both indoors with sufficient lighting as well as outdoors. Used widely with modern architecture and in commercial settings they are low maintenance and hardy. They work well both in mass plantings and as feature plants. They flower during autumn/summer and spring, so with some great flowering varieties you can easily add colour to your garden. Yucca are suitable for growing in containers or pots, although the larger species are best grown in the ground. Supplier and installer of advanced Bamboo together with Canary Island Date Palms, Cycads, Grass Trees for residential and commercial projects. Grass trees, palms, ferns, bromeliads, cycads, cordylines, yucca, bannanas, birds of paradise, succulents, dracaenas, ponytails, for all gardens sizes from small to large landscaped gardens. Advanced Date Palms available.